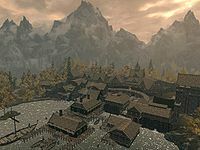 Riften (sometimes spelled Rifton) is the capital city of the Hold known as the Rift in southeastern Skyrim. The city lies close to the province's borders with Cyrodiil and Morrowind, and has become home to many Dunmer. It is built on the shores of Lake Honrich, nestled in the Fall Forest. It was in Riften that Barenziah joined the Thieves Guild when she returned to Morrowind from her exile in Skyrim, and the town is well-known as being the base of operations for the Thieves Guild in Skyrim. At its height in the Second Era, Riften was a fairly large city and a major hub of activity for trade caravans and travelers from Morrowind. It was also home to branches of the both the Fighters and Mages Guilds, and was a relative bright spot in the mundanity of The Rift. However, Riften fell into a period of decline beginning in 4E 98 when the Jarl was assassinated and replaced by Hosgunn Crossed-Daggers (who many believed was the one responsible for the murder). Over the course of his more than 40-year reign, the new Jarl imposed harsh curfews and unreasonably high taxes on the people, spending most of the accrued gold on the construction of a large, lavish wooden castle for himself. Hosgunn's harsh rule eventually led to a rebellion in 4E 129; much of the city was consumed by fire during the revolt, and many, including the Jarl, perished in the conflict. It took five years to rebuild the city, though recovery was ongoing and the city remained smaller than it had once been. Esta página foi modificada pela última vez à(s) 13h55min de 4 de setembro de 2015.